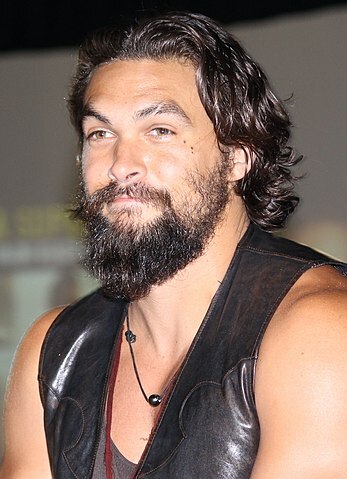 Jason Momoa was born in Honolulu, Hawaii, United States on August 1, 1979, is an American actor. Young Jason Momoa began his career as a model, he won the 1999 Hawaii's Model of the Year. He began his acting career in the action drama series Baywatch Hawaii (1999–2001) in role as Jason Ioane. He made his big screen debut in the road comedy film Johnson Family Vacation (2004) in role as Navarro. Jason's breakthrough performances came as Khal Drogo in HBO fantasy television series Game of Thrones (2011–2012). He played Arthur Curry / Aquaman in superhero films: Batman v Superman: Dawn of Justice (2016), Justice League (2017) and Aquaman (2018). He's playing a Declan Harp in the Netflix series Frontier, since 2016. He portrayed Ronon Dex in military science fiction television series Stargate: Atlantis (2005–2009). Momoa is in a relationship with actress Lisa Bonet since 2007, the couple married on November 15, 2007, they have a daughter and a son. His hobbies are snowboarding, long board skateboarding and ice climbing. He studied Buddhist teachings in Tibet. Big fan of the Conan the Barbarian stories. Fan of the Port Adelaide Football Club. I got called 'pretty boy' my whole life. I love life and if there's something that I'm playing that I love, I'll research it. I was 19 and folding T-shirts in a surf shop. And I got chosen out of 1,300 people to play a leading role on 'Baywatch Hawaii'. I didn't even know how to act. It took me five years to get an agent after [that]. No one would take me seriously after 'Baywatch'. I lived in the shadow of that for a long time. I haven't been an actor who's been able to pick and choose roles, and being a family man, it's been about putting food on the table. You get a lot of respect for Game of Thrones, and it was a lot of fun to play, but it didn't help my career a lot because Khal Drago doesn't even speak English.